The answer, of course, is: Add value. But we’ve heard that answer too many times. The real question is how do you add value? Sending generic emails to busy people asking them to share your content will likely go ignored. So what do most people do? They leave their content promotion to a few tweets and positive thinking. There is a better solution. Get the attention of and build relationships with influencers by creating content that is valuable to them and then sharing it with them in a direct, personalized way. We call this ultra-useful, relationship-building content “seed” content. I’m going to show you exactly how we amassed over 6 million impressions and 23,000 engagements (“likes,” shares, clicks, tweets, etc.) 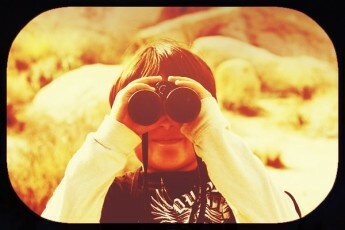 for Eyefi, a technology company in the photography space, simply by sharing seed content with a handful of influencers. Engaging seed content needs to be specific to your exact target group of influencers. So, it’s essential that you know exactly who you’re trying to reach before you create content. More often than not, if you just look for people in your niche, you’ll be limited. 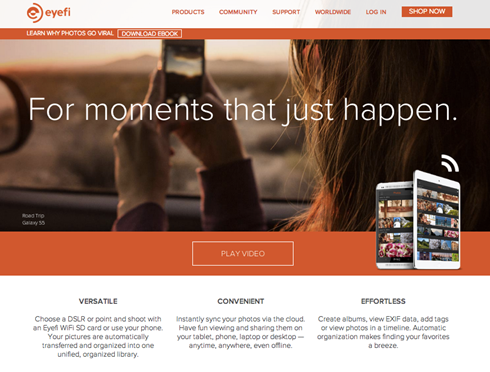 In our case, Eyefi is a company that sells photo-storage products: wifi SD cards, cloud storage, etc. If we stayed in that exact niche, we would target influential electronics and gadget critics. But that list is extremely limited. (Try naming more than three off the top of your head.) They also aren’t people who will easily share content because their entire job is to review products, so everybody asks them to share content about products all the time. Enter the umbrella method: Don’t just look at your exact niche, reach out to influencers covered by the umbrella of a related niche. In Eyefi’s case, a great adjacent field was photography. 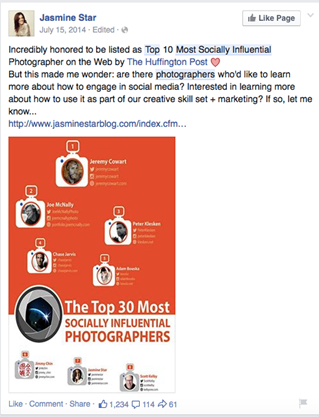 Famous photographers were a great influencer category to target. We knew that photography and photographers in general produce highly shareable content through visual social networks like Instagram, Flickr, and Pinterest. 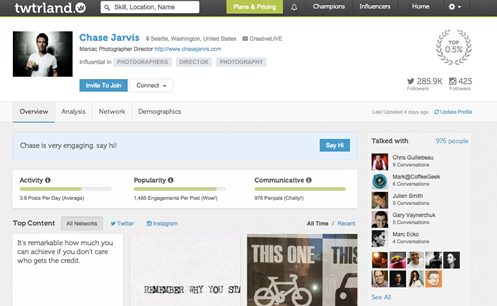 Once you find your influencer category, you then have to find the influencers. It’s tempting to make a list of influencers with the largest following, but remember that you don’t want followers, you want engagement. Influencers with high follower numbers do not always equate to high-engagement levels. If you’re going to toil over creating content, it’s important that people see it. In the case of Eyefi, we used a mix of proprietary methods and various online tools to identify engaged influencers, but you don’t have to get that fancy. You can use several super-fast tools to figure out if people’s followers are real, and who has the most engagement and relevancy in a particular topic. One easy tool for this is Twtrland. 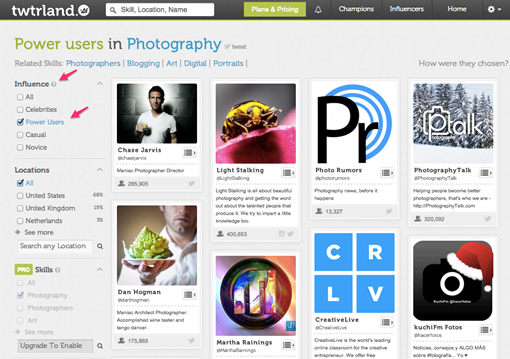 You can search for a subject such as photography and filter results based on influencer characteristics. Clearly, he’s in the top echelon in popularity, and he engages with his followers often (communicative). He is an influencer with whom Eyefi would want to engage. Using tools like this and even your own manual efforts of looking at possible influencers’ social media accounts, you can quickly make a list of 10 to 50 influencers who fall under your umbrella. Next, it’s time to make your seed content. 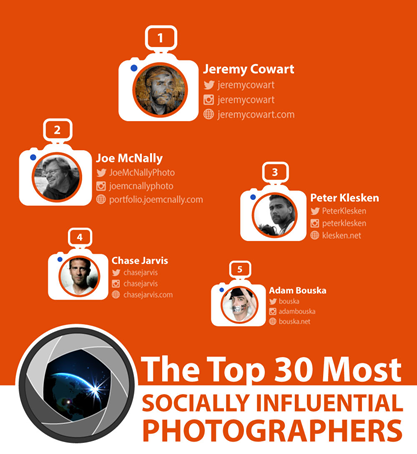 In our case, we made an infographic of the 30 most socially influential photographers for Eyefi’s content marketing team to use as its seed content. This little infographic generated over 6 million impressions and 23,000 engagements. How did we create such an effective piece of content? First, let’s note what we did not do: Send a generic promo piece on Eyefi or a discount code with which influencers could spam their audiences. Why? Influencers are inundated with those requests. Designing shareable content that directly benefited the influencers. Photographers want publicity because it helps them get more business. Our Top 30 list shone a light on their services and skills. Making the request easy. We did not ask them to review a product or endorse our brand. We simply gave them a free publicity tool. Good seed content possesses those two defining characteristics – benefit (something the influencer wants) and ease (something that doesn’t take a lot of the influencer’s time). Note: The lesson isn’t to create an infographic similar to the one we made. Your seed content could be an eBook or a blog post with a ton of content that still adds value to influencers. Creating an in-depth article on a sales technique touted by one or a few of the influencers you’re targeting. There are a ton of possibilities, but an easy way to make sure the content is something an influencer wants to share is to mention the influencer in your content. It’s an easy formula for getting influencers to share content because everybody loves promoting themselves (benefit), and it takes hardly any time to do so (ease). Now you have your seed content and a list of influencers, it’s time for the most nerve-wracking step: Getting your content in front of them. We didn’t tweet or share on Instagram with these photographers. We emailed them. Email is useful because it has high engagement. In contrast, social media is an ongoing stream of content that makes it easy for your message to get missed. Warning: Don’t just send 50 influencers the same generic email. Your response rate will be low and your seed content wasted. Don’t ramble – keep it short. Make it obviously personal. Don’t mass email. Research each influencer and include a personal sentence at the beginning to show your email is not spam. Think about how useful the content is to draw the influencer’s audience to you. Star’s fans obviously include a lot of photographers and aspiring photographers (Eyefi’s target audience), and from this one post they are exposed to Eyefi in a non-intrustive, non-pushy way. The results: We introduced millions to the Eyefi brand – all because we followed the three steps for seed content. We could have just emailed photographers and asked them to partner on an eBook, but with no credibility or prior relationship, the response rate would have been low. Instead, we invested some time and effort into engineering a piece of seed content that laid the foundation of a mutually beneficial relationship with several top photographers. The influential photographers gained publicity, and the opportunity to share top-notch, relevant content with their followers. We introduced over 6 million people to the Eyefi brand. In the world of content marketing you reap what you sow, so start out with a good seed. Looking for more guidance on influencer marketing? Download our complete toolkit, Influencer Marketing: The Latest Strategies, Templates, and Tools, for a simple 8-step process – including templates.